The model TF45 insertion thermometer is mainly used to measure the temperature of gaseous substances and also the surfaces of solids in the range of -50 ... +260 °C (-58 ... +500 °F). In conjunction with an additional thermowell, the insertion thermometer can also be used for temperature measurement in liquid media. The measuring element is connected to a connection lead and built into a heat-conducting probe sleeve made of stainless steel. The probe sleeve is proof against dust and jets of water and compressed onto the connection lead. 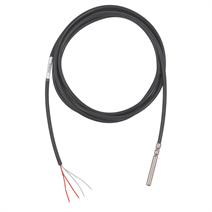 Depending on the version, the connection leads are suited to different temperature ranges and operating conditions.